The State Archives Administration on Monday published historical records that showed Tibet has been under the jurisdiction of the central government for more than 700 years, since the Yuan Dynasty (1271-1368). The archives, including 15 official documents about the conferring of titles upon Tibetan officials and the central government setting up offices in Tibet, were published on the administration's website (www.saac.gov.cn). "These are just a tiny part of the historical records," Yang Dongquan, the administration's director, said. "The records are indisputable proof that Tibet has been a part of China since ancient times and that it has been under the jurisdiction of the central government for the past 700 years," he said. An edict issued by Emperor Thogan Themur to Yontan Gyaltshan in 1362 that appointed Yontan Gyaltshan as the Pacification Commissioner in Tibet. It showed the Yuan Dynasty's central government set up the Pacification Council in the capital Dadu and the Pacification Department in Tibet in order to exercise jurisdiction over the region. An edict issued by the first emperor of the Ming Dynasty (1368-1644) to Hrogskunrgyal, appointing him the general of Olisi, a post in charge of the military and administrative affairs of an ulterior region in Tibet. An edict issued by the government of the Republic of China - then the central regime of China - approving the enthronement of the 14th Dalai Lama. 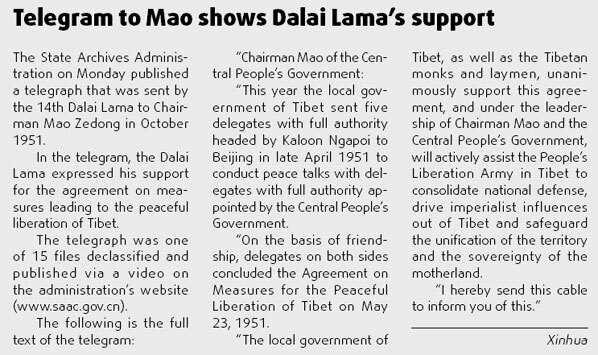 A telegraph sent by the 14th Dalai Lama to Chairman Mao Zedong in October 1951, in which the Dalai Lama expressed his hope of "safeguarding the unification and sovereignty of the motherland under the leadership of Chairman Mao and the central government". An ode sent by the 14th Dalai Lama to Mao, in which he wrote "Chairman Mao of the central government of the people" and "the great leader", championing him as "a loving mother who protects us". Yang said that because history and facts should be revered, these original historical records were "irrefutable evidence" that Tibet is part of China.